We love taking our dogs swimming during the hot summer months! They’ve enjoyed trips to lakes and rivers as well as the beach and always enjoy swimming. Beware of stagnant water. As water flows slow late in the summer, rivers and lakes can become stagnant…and dangerous. Among other dangers, warm weather always brings a rise in the risk of encountering brain-eating amoeba most often found in hot, stagnant water. Avoid small bodies of water that’s not moving. Watch out for blue-green algae. Hot weather also means a bloom of blue-green algae on many lakes and ponds. This algae is toxic for dogs and can be fatal. Consider a life jacket. Dog life jackets are a must for boating dogs but they’re also recommended if your dog is an unsure swimmer. (Plus your dog will just be so cute in it!) On that same note, keep your dog away from any dangerous currents in fast-flowing streams. Watch for water snakes. Living on a creek in Texas, we’re accustomed to keeping an eye out for water moccasins but water snakes can be found just about anywhere. Keep a close eye on your dog so he’s not nosing around holes in riverbanks or lakeshores. Bring fresh water for your dog. Yes, your dog will want to drink lake or river water but he’s safer drinking water that you bring from home. You’ll not only reduce his risk of running into potentially bad bacteria and parasites like giardia but also reduce the chance of minor tummy troubles. Watch for glass and metal. Just as our feet do when they’re wet for an extended period, dog paws get soft when they’re swimming–making them even more susceptible to getting cut by broken glass and metal. Carry a first aid kit. Accidents happen, whether it’s a cut paw or a thorn in a paw. Dry your dog’s ears. Water in your dog’s ears–especially floppy ears–can lead to ear infections. If your dog has been prone to ear infections, talk with your vet about an ear cleaning solution you can carry on your swimming trips. Dry your dog’s fur. Wet fur on the drive home can make your dog more prone to hot spots and other skin issues. If you have access to fresh water, it’s great to rinse your dog off then dry him before the trip home. Check your dog head to tail. Once you’re home, brush out your dog and do a good head to tail check looking for ticks, cuts, thorns, and any potential problems. 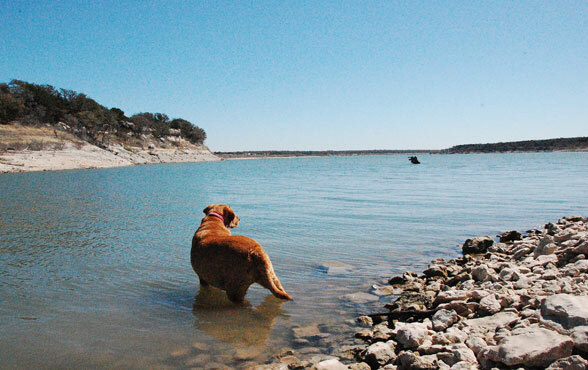 Taking your dog to a river or lake can be a great way to make summer memories…and you’ll wind up with one cool canine on these hot summer days!